This is Veteran owned and Veteran operated company that is dedicated to making quality Kydex gear for all your shooting needs. I have been in competitive shooting for several years. With my military background I noticed there was a gap in what was available on the market and what was actually needed. I started using other custom Kydex gear companies and found myself always having to fix other peoples work. I would spend $70, $80, $90 dollars on holsters and still having to work on them. My son started shooting matches with me a few years ago. I got him a custom Kydex holster for his birthday one year and watched him struggle trying to work through the issues of a lesser quality holster. This is when I decided it was time to fill the gap! This is how TAK (Troy Allen Kydex) Gear was started. We address every problem that we found with other holster and gear makers. We have addressed the retention, the release and the fit issues that others seem to fall short on. 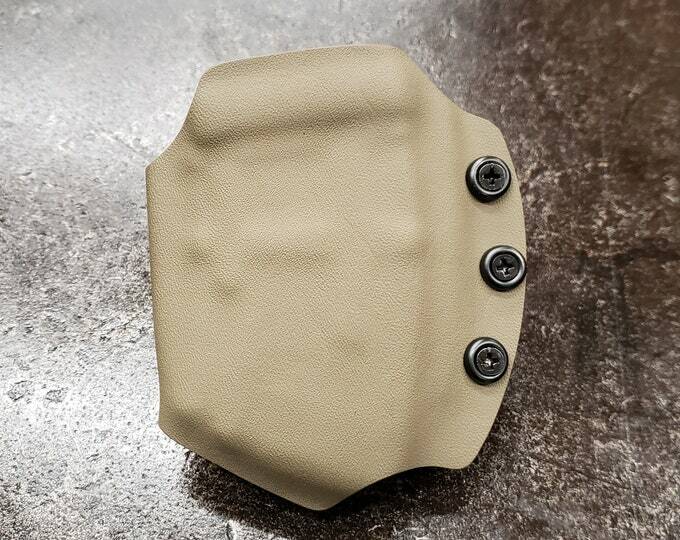 All of our gear is made with quality Kydex materials. Every piece of gear that we make goes through a quality inspection to assure that it functions the way it should. We do not charge extra for larger belt loops as they are standard for our gear. We do not charge extra for your gear to be Grey, F.D.E., Pink, Blue, etc. It's your choice for no additional cost. This company is veteran owned and veteran operated. It is tested by shooters that put our gear through the worst conditions. Our gear is used at ranges for concealed and advanced concealed carry classes. There are several range officers that use our gear due to the comfort and versatility that our product provides.